We were very excited to meet the stylish Nadine Bouler and her husband, leading Long Island "green" architect James of Bouler Architecture, at Verace in Islip New York, the latest addition to the Bohlsen Family restaurant group. We had read such great things about it and knew that the design - by Bouler Architecture - was going to be stellar but we had no idea how exceptional it was going to be on both fronts. The restaurant has a mix of traditional architectural details - lots of reclaimed wood, brick exterior, mahogany window frames - with cutting-edge elements: oxidized steel wall surrounds, a concrete patio water feature and a swirling, abstract vaulted ceiling. Retro orange tiles in the open kitchen and mushroom pendant lamps in the bar give it a groovy vibe while the softer elements, an upholstered wall on the second floor dining room and long drapes in the main room reduce the noise level and add a warm, cozy ambience. It's a knock-out. We were lucky enough to get a guided tour of the place by the architect himself. For the project history and all the before-and-after photographs - a de-facto virtual tour - visit Nadine Bouler's site. 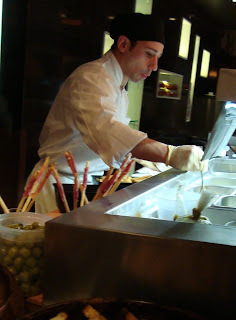 As for the food, Italian chef Francesco Torre is in the kitchen and here, too, there is a mix of rustic and modern. My Crab Ravioli on a Green Chard puree not only matched my shirt but had the right balance between the sweetness of the crab and the tart tang of the chard. Both The Guy and I opted or the Roasted Pork with Sweet Italian Fruit and Mustard Sauce as our "Secondi", which was deliciously moist with a real pork flavor. Props too for the authentic bolognese sauce and the better than traditional crunchy tiramisu! The wine, from both Italian and New York vineyards is custom-blended and stored in eco-kegs, then pushed with nitrogen to deliver a pure, unspoilt glass or carafe per order; no danger of corked wine here. Verace is also committed to delivering the best tasting, most environmentally-sound table water. To this end they offer only their own state of the art filtered water - flat or carbonated - served form reusable bottles. 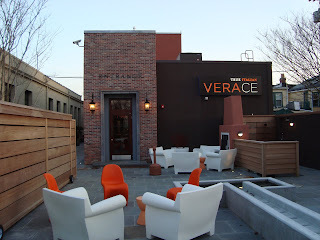 Verace is a fabulous restaurant and I'm planning a return visit for one of the regular Monday Wine Dinner Events. And if they ever start a Facebook Fan Page, I'll be the first to join! James read your entry and said (over a glass of prosecco, I might note), "Damn she's great." A great time, indeed. I am in love with that brown & white floral wall. Stunning. Just found Verace on facebook and Twitter - social media rocks!